From the iconic Aquaracer collection by luxury watchmaker TAG Heuer, this exquisite Swiss Made timepiece features a brushed and polished stainless steel case and bracelet, white dial with luminescent markers, date aperture, classic logo branding and 300m water resistance. The ideal watch for the woman who demands more from her accessories. 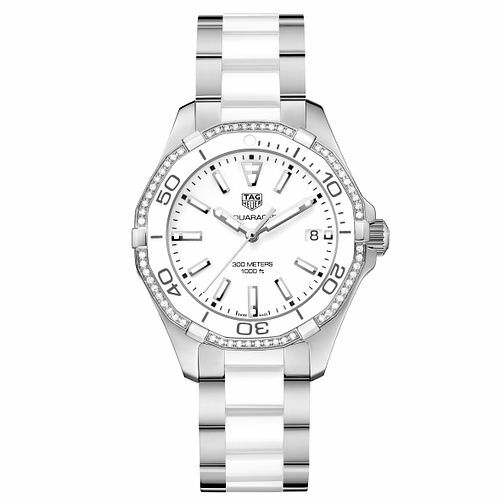 TAG Heuer Aquaracer Ladies Two Colour Diamond Bracelet Watch is rated 5.0 out of 5 by 1. Rated 5 out of 5 by Anonymous from Beautiful Watch This watch is beautiful. I am so happy with my purchase. Only one small negative - I purchased online and I am from Northern Ireland - none of the Ernest jones shops in NI supply Tag Heuer watches so it was a bit of a challenge to have the links removed. I found a local supplier of the brand and paid a nominal fee to have the watch sized.